My advice, don’t be afraid to utilize the technology you have at hand, whether a smart phone or tablet, or the in flight entertainment. And make sure to read next Friday for the rest of what I carry-on for Z to keep her entertained. Hyland’s had been a common brand in our home . And when was someone was kind enough to send their products while we were traveling, we used them during our travels as well. Hyland’s make homeopathic natural remedies for almost everything you can think of. Hyland’s description of Calm Forte for kids is as follows “When your child is not sleeping or resting well, his or her whole cycle goes out of sync. The days can be as restless as the nights! Here’s the medicine that’s trusted by thousands of families who now enjoy long, restful sleeps. Hyland’s 4 Kids Calm ’n Restful brings on the calm and it does not cause any next-morning fogginess, so your child is back in business after a good night’s rest!” I copied this directly from their website and I have to say that this product has worked wonders to combat jet lag, not only for Z, but for us parents as well. Be aware that this natural calming aid is for ages 2 and up. I would say that this is our saving grace almost every time we take a long flight (that and the iPad). None of us has had jet lag when we used this homeopathic remedy. Not only that but one bottle has lasted us a year and a half! It is worth the money. ← Wednesday Write-Up: 201 Posts! Good tips for older kids (and adults too)! The Hylands Calm and Restful stuff sounds good – might be seeking that out for myself! It is amazing how good it works! If you have a whole foods in your area, check it out! On our last long flight they couldn’t get the seat back entertainment system to work for the first two hours of the flight (and I was very afraid that they wouldn’t get it to work for the whole 12 hours flight!). I had made the ridiculous mistake of bringing virtually no back up entertainment, so I was petrified with fear over how I’d keep my two kids entertained! I was already dreaming up puppets using the air sick bags and thinking through how many hours of battery life my phone had… This was also a daytime flight (the only direct flight from Hong Kong to Seattle), so I had no hope that they would sleep. Oh my! We had to do a daytime flight from Chicago to London this year. It was the only way to get there! So frustrating, but the iPad saved us, that and letting z walk up and down the aisle with us (when they let us–they kept the seatbelt light on about 4 of the 7 hours). So happy I only have to deal with my jet lag. 🙂 Great tips and I will smile the next time I see toddlers running madly around an airport. You are a wonderful person to do so. So still no miracles out there? 😉 Sensible tips though! 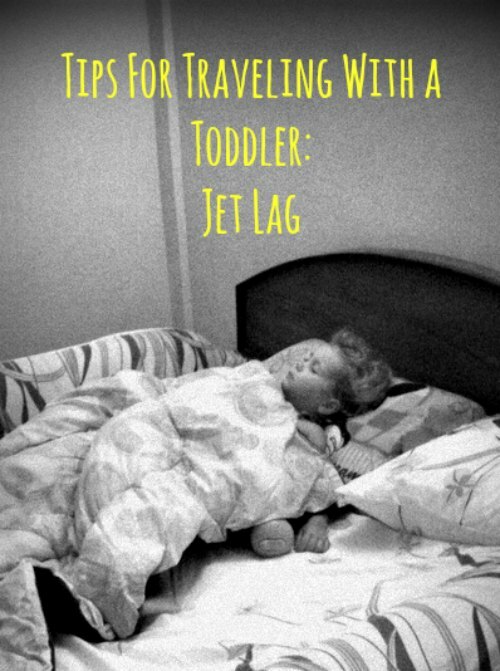 So the one tip I have to add is: sleep when toddler sleeps on the plane (when you watch that one movie/read that one book, by the time you are done and about to sleep, at least one of the toddlers will wake up. Says Mr Murphy), and if toddlers fall asleep the next day, you go to sleep as well. And succumb to the fact that you can’t take care of your own jet lag until you’ve gotten your kids in some rhythm. That is a good point! I will add that! Thanks for this post (and the shout-out)! The nap-before-flight thing. Do you think it still works when your child completely lacks a quiet/tired stage and instead goes straight from calm/awake/alert to radioactive-squirrel-on-crack? I wouldn’t know honestly! Z doesn’t have that, she sometimes gets a little over-emotional when she’s tired, but that’s about it before she crashes. I know there are children that do though. If that is the case for you, I would leave that tip out and just do the run wild one maybe. 🙂 at least maybe they would be physically tired if not mentally? I think the run around before hand does help flush the adrenalin out of the system under the circumstances (reduces the cortisol/increases the endorphins? it’s some neurochemical thing I’m sure of it). Even so, though… there have been times I’ve had to forcibly restrain an overtired toddler. Anyway, thanks for this write-up – gives me more confidence to try it out. Wow, very thorough! We don’t have any major traveling planned in the near future, but I’ll definitely keep these in mind if we travel across a few time zones. Just got off a plane with tons of kids. Evening flight. I was traveling with two other friends that were grumbling about the crying at takeoff, and I turned and said, “Kids are a fact of life, if you’re going to act like that I’m changing my seat.” All the kids were nicely settled and asleep a half hour after we were in the air. I love seeing parents traveling with kids! It was way worse to travel with a smoker who couldn’t have a cig at layover. She was way worse than a toddler! Adults can make a flight much more uncomfortable for everyone than a child. I think it may be the fact that adults should know better and should have the ability to change their reactions and behavior. Thank you! I hope that they will help you and your little one. 🙂 Japan is a fantastic country (we have only been to Tokyo, but it was awesome!). Thanks for stopping by and commenting! Those are some great tips. I wish I had read these when we started taking our daughter traveling internationally. Fantastic trips! We travel often and I always let my kids run around the airport despite the crazy looks I get. I’ve never heard of the Hyland’s! I’ll have to look for that!! Great post! Man it would have been helpful to have amusing and helpful blogs like yours when you all were little. Great post! Great tips! This is pretty much exactly what we do. Running around like crazy wild animals before the flight is a must. And we are on the same page about following everything according to the new time zone. It drives me crazy when people say, well, it’s only like 2pm at home, I should stay up! No, no, no… We had high hopes for Hylands, but Calm Forte never worked for our kids :(. We have used lots of homeopathic stuff, but this just didn’t seem to do a thing. Oh that is such a bummer about the calm forte! I know it won’t work for everyone. If I find anything else I will let you know. I couldn’t agree more. It’s difficult to convince people of that though ;). Such relief!That is a good point! I will add that!